R. K. Narayan (1906 – 2001) was an Indian author, who was one of the leading figures in early Indian literature in English. 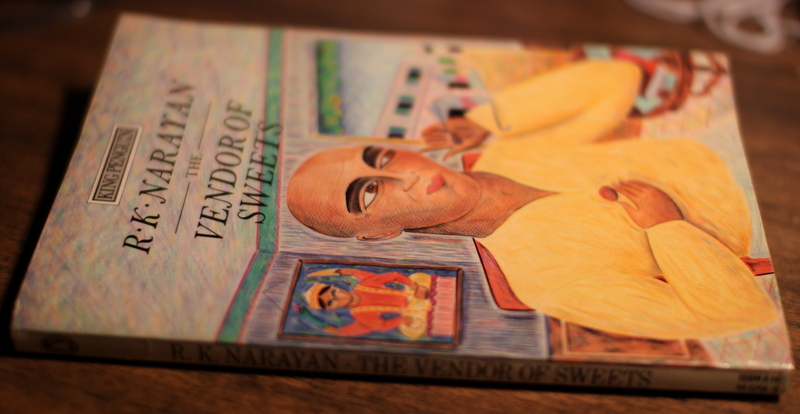 “The Vendor of Sweets” is one of his short stories that was first published in 1967 and was another one of the stories that was set in Narayan’s fictional town named Malgudi in South-India. This short story follows a short period in the life of Jagan, a man who is about to turn 60 and owns a Sweet shop. Jagan is a rather curious character as are many of the characters I’ve come across in previous works by Narayan I’ve read. Jagan follows a really strict diet and life philosophy and has over years accumulated quite a lot of money from his sweet shop, which he keeps at the best possible level. He’s life if filled with routine until one day his son Mali decides he doesn’t want to go to college any more. Instead Mali wants to become a writer and write a novel in about five months for a contest. Jagan is fine with that, as he can proudly say that instead of reading what other people write, his son is now giving other people something to read. However for some reason or other Mali’s novel doesn’t seem to get anywhere and after the contest deadline has passed Mali suddenly wants to go to America to study how to write novels. But that’s just the beginning of the story. Now having studied and gotten wiser Mali wants to start a business (and not take over his fathers sweet shop) and that’s something that is nothing but trouble as you can find out in the story as arguments and misunderstandings ensue about whether Mali is really married or not and why has Jagan suddenly dropped the prices of the sweets in his shop. And of-course someone has to go to jail and someone has to want to leave home. What surprised me about this story is that Jagan goes through real growth in the stories scant pages. In the beginning he is really shy with his son, always wanting to please him and almost never even talking to him directly, but through some middle-man. But by the end Jagan has gained some kind of confidence, he doesn’t care anymore what his son thinks of what he says and while throughout Mali’s life Jagan has tried to make his life as comfortable as possible, in the end, when Mali ends up in a police lock-up Jagan won’t even take the time to go and see him, but instead is hurrying to a bus-station to get out of his old life, away from the sweet shop and to start something new with his life. This entry was posted in Fiction, Indian literature and tagged book review, R. K. Narayan, The Vendor of Sweets. Bookmark the permalink.